Good Records in Dallas is Planning One Hell of A ‘Record Store Day’ Event!!! Dallas’ best music store is planning their 5th annual Record Store Day and event which promises to be the place to be on Saturday, April 21st. The event will be Good Records’ 12th birthday and is being dubbed the 12 Step Program. There will be bands, good music for purchase, limited releases exclusive to Record Store Day, and one hell of a party that will last all day and night. 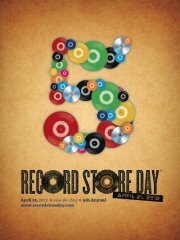 Of course we will be celebrating the 5th Annual Record Store Day as well as our store’s 12th Birthday. Bands, releases, and party details still to be announced but for now MARK YOUR CALENDAR as this is the place to be all day on Saturday April, 2012. You know the drill. Rest your liver and save your money accordingly. This entry was posted on Tuesday, April 10th, 2012 at 3:59 pm	and is filed under Events, Music, News. You can follow any responses to this entry through the RSS 2.0 feed. You can skip to the end and leave a response. Pinging is currently not allowed. « ‘Pineapple Express’ Director Will Remake ‘Suspiria’ for the Big Screen!! !